This July, Superior Spider-Man writer Dan Slott is joined by Amazing Spider-Man #700 artist Humberto Ramos head to Shadowland in July's Superior Spider-Man #14. 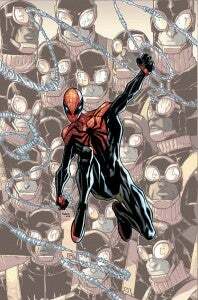 Kicking off a new story arc, launching during Marvel's "Superior Spider-Month," promises to reshape the world of Superior Spider-Man. Continuing his personal quest to show the world why he is truly the superior Spider-Man, Otto Octavius looks to add cleaning up the City of New York to his list of accomplishments! But what’s his plan of attack? Eliminate Shadowland. All of it. With the Kingpin and Hobgoblin running crime throughout the city for far too long and nobody daring enough to take them down, the Superior Spider-Man takes matters into his own hands!